The CMS for the particular needs of perfectionists. Widgy is a Python CMS built on Django, so you already know your way around the code. Promgrammers will feel right at home. Widgy is released under the Apache 2 license, so you have the flexibility you need, with added protections for your business. Widgy allows Python/Django programmers to customize widgets and for marketers to easily create and optimize content for SEO and usability. 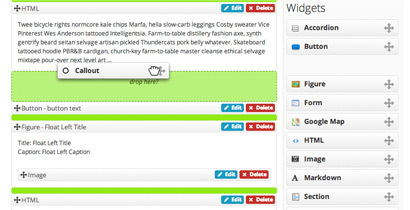 Widgy has a simple drag & drop interface that helps marketers easy publish complex content like tables and accordions. Not Just an HTML Editor Use Widgy to edit any heterogenous tree-structured data! Page Builder Includes common & advanced widgets for building out web pages without needing to know HTML. Form Builder Drag & drop to create forms, success emails, or link to Salesforce. Download submissions as a CSV. Integration with Mezzanine CMS Provides a new Page type for Widgy content instead of a typical TinyMCE. Review Queue Advanced versioning for Widgy pages. Set file permissions, review changes between versions, schedule publishing, and preview changes. Django Authentication Integrated with the Django authentication framework. Control which widgets users are able to edit. ModelField & FormField Add Widgy to any model that you want, even add multiple widgy fields to the same model. Drag & Drop Editor Easily edit complex tree documents. Widgets are Django Models Just write and model a render template — widgets can be customized through inheritance. Widgets are Django Templates To change how a widget renders, just override its template. Presto-blammo! Links Framework Allow widgets, like Button, to link to any model. Include your own Django Apps Easily include django apps into the page tree with Plugins (urlconf_include). 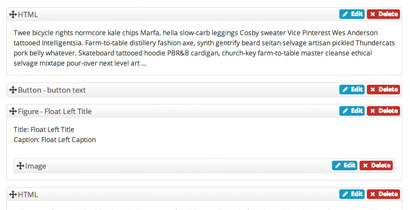 Painless Search Integrated with django-haystack. Super-Powered Compatibility Methods The compatibility framework helps make sure that widgets can only go where they are expected (users can't mess up their site). Override compatibility for built-in widgets to suit your site's needs. Optimized Static Assets Integrated with django-require for optimizing the Widgy editor static assets. Debugging Helpers Widgy provides django-debug-toolbar panels for investigating what's going on with Widgy rendering. Easy Usability Controls Widgets and callouts allow you to control the way content is presented to users. More Than Just Text Widgets allow you to easily add images, tables, tabs, and accordions. Here's how to get some help. Please contact us for paid support options. Widgy is brought to you by Fusionbox, a Denver digital agency with a heart for Python. ©2016 Fusionbox, Inc. All rights reserved.